Lot Detail - Chicago Black Hawks Early-1940s Game-Worn Wool Jersey Attributed to Earl Seibert - Team Repairs! Chicago Black Hawks Early-1940s Game-Worn Wool Jersey Attributed to Earl Seibert - Team Repairs! Part of the first father and son team to be granted admission to the Hall of Fame when he joined his father Oliver in 1963, Babe Seibert spent over a dozen seasons in the world’s best league, well remembered for his large stature and physical demeanour. Reputed to be the only man notorious bruiser Eddie Shore refused to fight, Seibert factored heavy in another superstar’s career, when he laid the hit that lead to Howie Morenz breaking his leg in several places, which ultimately, ended his career. Seibert would earn first or second NHL All-Star Team selection every season from 1935 to 1944, winning a Stanley Cup with the Black Hawks in 1938. We are pleased to offer a Chicago Black Hawks wool sweater that has been attributed to the Berlin native during the early-1940s, with this particular style of sweater worn by the Hawks in both 1940-41 and 1941-42. A small faded label is affixed to the collar, with the sweater measuring-out across the upper reverse to roughly a modern size 44 – with this sizing consistent with two other Seibert wools from the early-1940s we sold previously. Recognized as the “barber-pole” style and featuring a gorgeous felt Indian head team crest with “Chicago Black Hawks” appliqued along with intricate stitched detailing, “17” has been affixed to verso in thick white-over-red felt, with reinforced elbow sections also utilized. 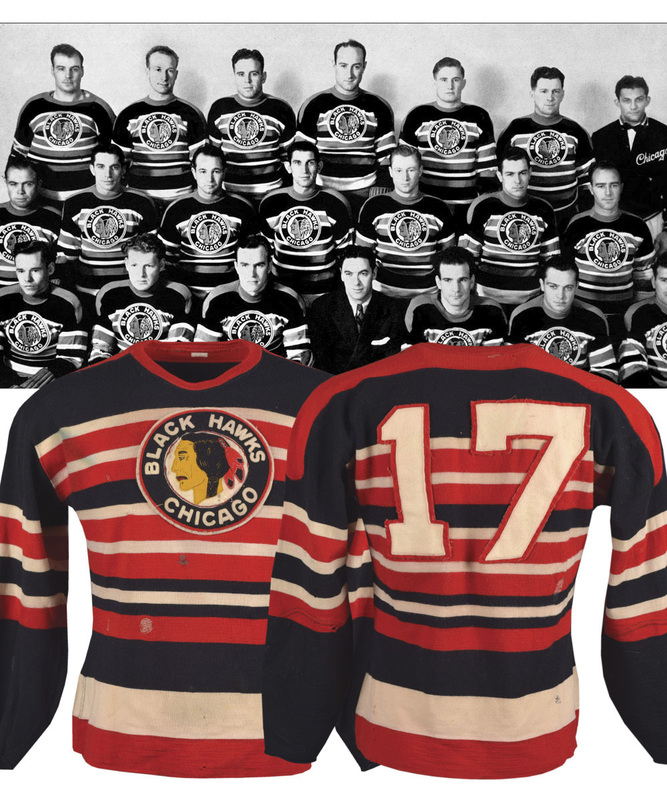 One of the most sought after of all vintage styles, this desirable Chicago Black Hawks sweater experienced Windy City action at the dawn of the Original Six era. The colours of both the sweater and team crest remain bright and vibrant, with all material supple. Each cuff has been trimmed, with some loose and stray threading over the reverse numbers. A few small random holes are visible, but none obtrusive, with over 20 team repairs throughout, situated over the front, reverse, sleeves and neckline. 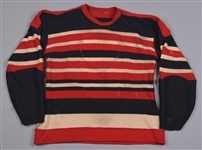 We should also note that the team crest and numbers were removed at some point and have been poorly sewn back on, but there is no evidence of the sweater ever having different numbers, with the size, font and material of the numbers and team crest again identical to the other two Seibert sweaters from the early-1940s that Classic Auctions has sold previously. It should be further noted that evidence shows that the team crest was originally placed higher.